A special birthday / mothers day gift for mom, this sweet mother's pendant honors everything she means to you. Sweet and stylish, this engaging fashion mom pendant will take her breath away. 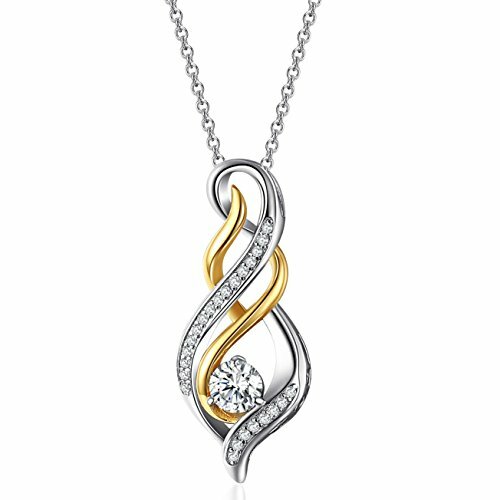 Crafted in 925 sterling silver and 14K gold plated, the twisting flame-shaped design is scattered with sparkling cubic zirconia diamond accents. A flower-shaped cluster of diamond accents anchors the design. On the side of the style, the word "MOM" reminds her you're thinking of her always. Polished to a brilliant shine, this graceful pendant suspends along an 16.0-inch+2'' loro chain that secures with a lobster clasp. The Caperci Jewelry pieces are designed for modern men and women and we are aim to build the world's top 10 popular, high quality fashion jewelry and exquisite affordable engagement & wedding ring. Caperci Direct is committed to provide high quality jewelry and best services to all customers, your Feedback is our motivations to improve.